Guided Salmon Fishing Day Trips and Fishing Holidays in Scotland. We provide salmon fishing trips and salmon fishing holidays on some of the finest salmon fishing rivers in Scotland including the Tay, The Spey, River Earn, North Esk and South Esk rivers. Our team of select salmon fishing guides have extensive knowledge of all of the rivers and beats that we fish and are expert at delivering high quality salmon fishing days and 3 to 6 day salmon fishing holidays. 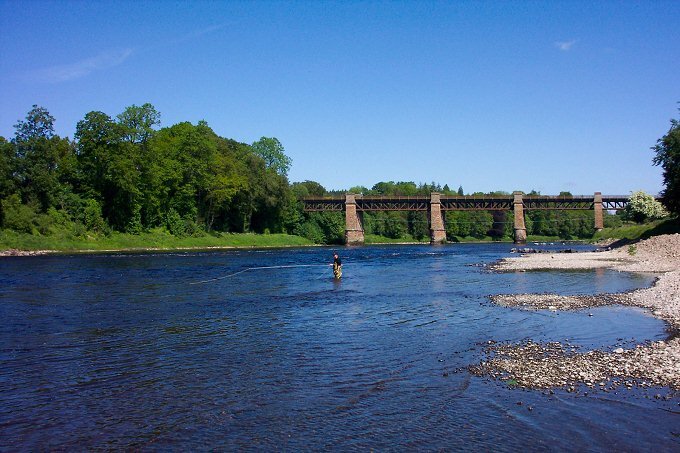 Our salmon fishing trips predominantly take place on the River Tay in Perthshire which is renowned as being one of the best salmon fishing rivers in Scotand. The River Tay is the longest river in Scotland stretching for 120 miles through some of the most beautiful scenery in Scotland. There are over fifty individual salmon fishing beats on the Tay offering a wide variety of salmon fishing opportunities. We take our clients to some of the most productive, quality beats and if you join us for several days will try to take you to a different beat each day to give you a greater salmon fishing experience whilst taking in more of the stunning scenery and wildlife Perthshire has to offer. 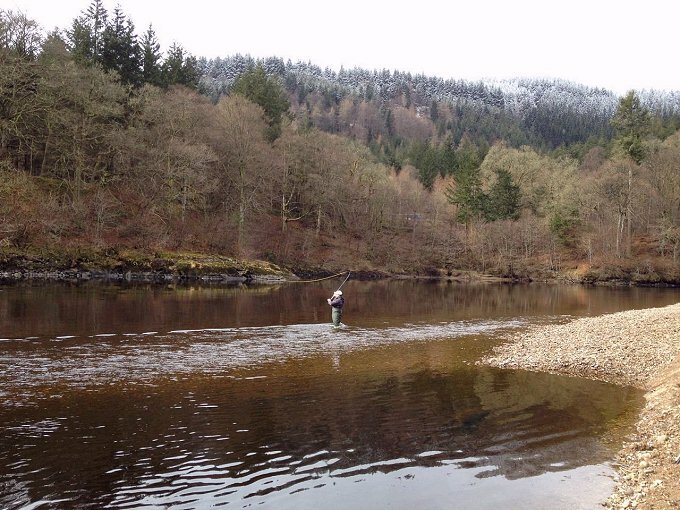 The salmon fishing season on the River Tay is from the 15th of January until the 15th October. All of our our salmon fishing packages include a highly experienced, professional salmon fishing guide, fishing permits for quality beats and Spey Casting lessons if required. We also provide all of the salmon fishing tackle you will need and transfers from your hotel each day. All of the beats that we fish are quality salmon fishing beats with the facilities that you would expect on a quality salmon fishing venue including very well maintained grounds, a salmon fishing hut with hot drinks, a fridge for cold drinks, a microwave or cooker to heat meals, a dining area and toilets. 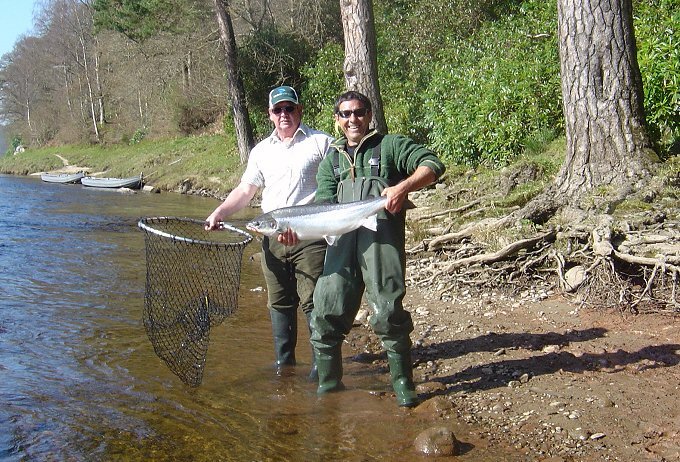 We specialise in teaching Speycasting and fly fishing and have successfully taught hundreds of clients the art of salmon fishing and Speycasting. Our guides are renowned for their knowledge, patience and good humour. 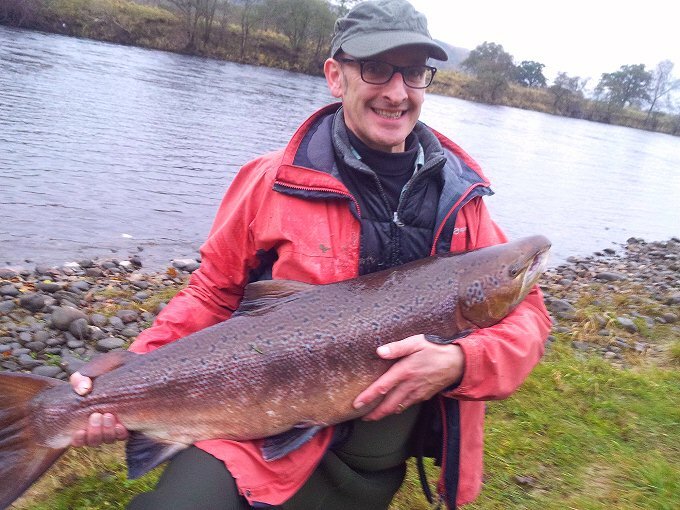 Whether you are a fully experienced salmon fisherman or a complete beginner, we will give you the best possible chance of catching a wild, Atlantic salmon. 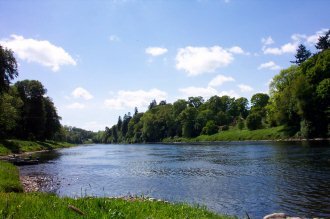 There are a few beats on the River Tay that allow spin fishing so If you are not interested in fly fishing and would prefer to spin fish, we can arrange a package trolling on a boat or spin fishing from the bank on the River Tay. All of the other rivers that we fish on are fly fishing only unless the water levels are too high or coloured to fish the fly. 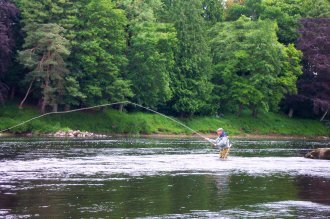 If you prefer to fish on a smaller more easily fished river we can take you to the River Earn which is a tributary of the River Tay or the North and South Esk rivers in Angus which are both excellent salmon fishing rivers. Although smaller than the River Tay, the beats that we fish have an annual catch rate equal to some of the very best beats of the Tay. All of the salmon fishing venues that we take our clients to are private, very well maintained venues with the same quality facilities as a top beat of the River Tay. The South Esk is also regarded as one of the best sea trout rivers in Scotland and our local salmon fishing guide is a specialist in sea trout fishing. More details of our sea trout fishing trips will be added soon. Our clients come from all over the world to fish for salmon on the River Tay and many of them come back year after year to enjoy our outstanding hospitality, the beautiful scenery and the world class fishing opportunities that the Tay has to offer. We fish on the top ten of over 50 beats on the Tay and our guides have extensive knowledge of all the that beats we fish. Even if you have no prior experience of fishing for salmon we can teach you the art of Speycasting. Our guides have been giving Speycasting lessons for decades and we pride ourselves on our uncomplicated and very effective method of teaching beginners how to cast correctly. If you prefer not to learn how to Speycast we can always take you spin fishing. Our guides are all full time professional salmon fishing guides and Speycasting instructors with an expert knowledge of the rivers and beats that we fish. Our team of guides are well versed in putting together a salmon fishing trip to suit your personal requirements, level of experience and style of fishing. They will advise you on the best line and flies to match the beat and conditions of the day, show you the holding pools and how to fish them and will be on hand at all times to provide as much or as little advice you might need and of course help net, land and photograph any fish you catch. If you are coming to Scotland for salmon fishing, then choose one of the best salmon fishing guiding services available. We will give you a Scottish Salmon Fishing Experience to remember. We will provide great fishing, great locations, stunning scenery and amiable company in the way of our expert Ghillies. We have a range of fishing trips to suit all budgets and levels of experience from beginners to well seasoned anglers, spinning or fly fishing on quality, productive mid range salmon fishing beats to premiere, very productive, high end, salmon fishing beats with top quality facilities. Three or Six day, three river, salmon fishing trip. Join us for 3 or more days and we can take you to a different river each day or different beats on one or two rivers including the River Tay and the River Earn in Perthshire and the North and South Esk Rivers in Angus. This will give you the experience of fishing some of the best salmon fishing beats on a variety of very different rivers in Scotland. We will pick you up from your hotel each morning and take you to which ever river you are fishing on that day. You will be accommanied by one of our highly experienced, salmon fishing guides and Speycasting instructors, who will be exclusive to you or your party. This is an excellent opportunity for the seasoned salmon angler to experience a varied and unique salmon fishing trip. For anyone new to salmon fishing or Speycasting this is a great introduction to the world of Scottish salmon fishing. We will provide you with Speycasting lessons and an in depth course on salmon fishing. We also provide all of the fishing tackle required, safety vests and waders. We cater for individuals or groups. B&B accommodation and airport transfers can also be arranged. Our 3 day trips can be taken on any 3 days from Monday to Saturday inclusive. There is no salmon fishing allowed on a Sunday in Scotland by law. If your trip has to be taken over a long weekend we can include a day on the river for wild brown trout or a day boat fishing for rainbow trout on the Sunday. “ Dear Les, I have just returned from my three day fishing trip in Scotland and wanted to express my gratitude to all concerned for a very enjoyable and exciting memorable trip. I am pleased to say that under the professional guidance of my Ghillie that my trip enabled me to learn how to fly fish, and most of all catching a 17 lbs spring salmon which will be forever in memory as it was my first time to fish this style of Angling. ( Pic Enclose ) For any one who is thinking of booking a trip with you, can rest assure that they will be spending thier money wisely. Please pass on my sincere thanks to my guide for making my trip a memorable one, his skill, experience & kindness is second to none. Thank you. I just wanted to drop you a line to say thank you very much for setting me up with a day?s Salmon fishing with Moray. Everything was perfect and I very much enjoyed the whole experience from early start (Landrover, terrier, mist in the trees and leaping salmon taking the mickey) to finish (in the pub with a pint and a nip, covered in slime from a 24lb monster!). Moray was great, exactly what I had hoped for. He looked after me very well and I found his tuition informative and encouraging (even if I suspect he was being polite about my casting). Moray was very easy company and I had absolute confidence in his advice and recommendations. Even if I had not caught a fish I would have no hesitation about recommending Fishing in Scotland and Moray to my friends. As it was, you have both provided me with a perfect memory which I will dwell on until I can get back onto the water again. Thank you for sending the pictures. Janet and I thoroughly enjoyed our day on the river. Your guiding services made for a great experience and the day far exceeded our expectations.